Casa Casuarina : Scroll down for information about the Versace House on Ocean Drive in South Beach. This page allows you to find directions, read reviews and make reservations at the Casa Casauarina Hotel in Miami Beach. And don't forget, you also get rebates on muliple day stays. Casa Casuarina provides FREE shuttle service from Miami Airport. Hotel guests are also granted temporary membership to the private club during their stay. The facility incudes a garden, pool, spa and dining room. Delta Air Lines Skymiles Participant. Casa Casuarina aka the Versace House was built in 1930 and modeled after the Alcazar de Colon in Santo Domingo, a residence built in 1510 by the son of Christopher Columbus and reputedly the oldest existing house in the western hemisphere. Gianni Versace purchased the building in 1992 for $2.9 million. After receiving city approval, he demolished the hotel next door, and a two-story, 6,100-foot addition was built, transforming it into Versace's Miami Beach house. Peter Loftin, a telecommunications billionaire, purchased the house from the Versace Estate in September 2000 for approximately $19 million and has since resided there from time to time. The City has allowed Mr. Loftin to convert Casa Casuarina--the scene of Versace's 1997 murder, into a member's only club. The house is also available for private events. Click HERE for Casa Casuarina Lodging Information. Take 836 East to 395 East (Miami Beach) to A1A East. At the end of the causewy, A1A becomes 5th Street. Turn Left (North ) on Ocean Drive. Casa Casuarina is located at 1116 Ocean Dr., Miami Beach, FL 33139. Use our Miami hotel map to find the exact location. Will you be visiting Miami soon? This might be your only chance to see the inside of the Versace Mansion. The folks at the Versace Mansion are going to start offering guided tours inside the infamous house on Ocean Drive. The shooting of Gianni Versae is perhaps the most visible and memorable homicide in Miamic Beach history. The mansion is one of those places you just have to go to. The only problem is, most of us can’t make it past the front door. "The Lord Is My Shepherd," performed by Sting and Elton John brought mourners to tears today at a memorial Mass for Gianni Versace. Many people conact us requesting information about staying at the Casa Casuarina Hotel. I can understand the curiosity. How can I rent Casa Casuarina? The rental cost starts at $25,000. 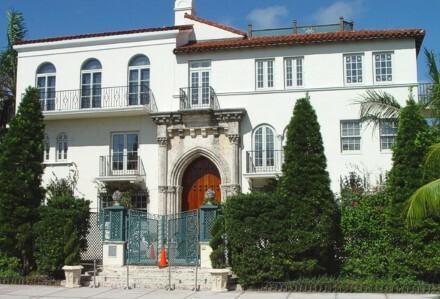 The event company and caterer that oversees the venue is Barton G.
Casa Casauarina in Miami Beach 411's city guide.